There is a slight trick to this recipe. I made no bake cheese cake cupcakes first and left a little of the cheese cake batter in the mixing bowl. Mixing it up with the cake mixes adds a lot of moister to the finished cupcakes. The pumpkin spice comes in when you mix up your icing. I added a little pumpkin pie spice to it, as well as neon orange gel food coloring. Set that aside. If you don't have orange sugar sprinkles, you can make your own. Take 1 jar yellow sugar, a dash of red sugar, a dash of pink sugar and 2 drops orange gel food coloring. Mix thoroughly, set aside. First spread about a teaspoon of icing onto the top of each cupcake. It doesn't have to be perfect, its going to act like glue. Cut one mini cruler or twist doughnut in two. Place one half, cut side down, onto each cupcake. 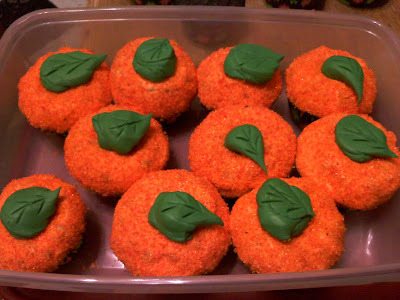 Cover with each with orange frosting. Remember the center should have a small divot from the doughnut. The leaves are just really stiff green icing, piped from a sandwich bag. They did not turn out the way I wanted them to. . . .
Now as far as taste; these were super yummy!! They are really moist and the pumpkin pie spice in the icing adds and extra dimension of flavor without being overpowering. I will definitely make these again! !